Mealtimes are meant to be enjoyable. But the worry of spilling food or drink can turn a simple pleasure into a trial - and an ever-growing pile of dirty clothes to be washed. 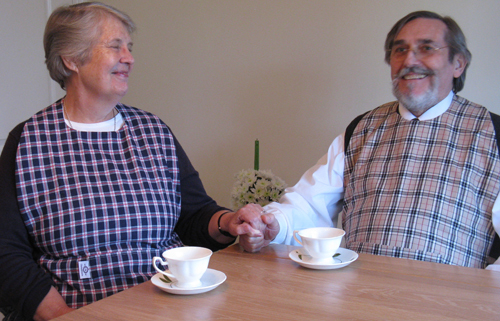 Charles & Victoria Apron Dining Tops aare the perfect solution to an everyday problem for so many people - the elderly or infirm, anyone confined to bed during post-operation recovery. Apron Dining Tops are even useful for mums of younger babies, when the weaning process and the move to solids can get messy. More attractive than adult bibs, which can have such a negative impact on confidence and emotional wellbeing, Apron Dining Tops are functional and effective in protecting clothing from becoming dirty or stained. Why choose a Charles & Victoria Apron Dining Top? Available in a range of attractive fabric patterns, Charles & Victoria Apron Dining Tops are made in the UK to the very highest standards from top quality fabric and feature completely enclosed seams for a smooth finish. Absorbent 100% cotton with fleece backing for everyday spills. Super soft fabric that is wearable all day and won't irritate. Includes a handy front pocket for belongings. Velcro attachment around the neck, so can be adjusted to fit. Waist ties keep the Apron Dining Top in position and ensures clothing is kept clean. Fitted, tailored shape looks smart. Designed to be washed over and over again - and still stay soft. Ready to buy a Charles & Victoria Apron Dining Top? Visit the Charles and Victoria Online Shop and simply choose the pattern you prefer.